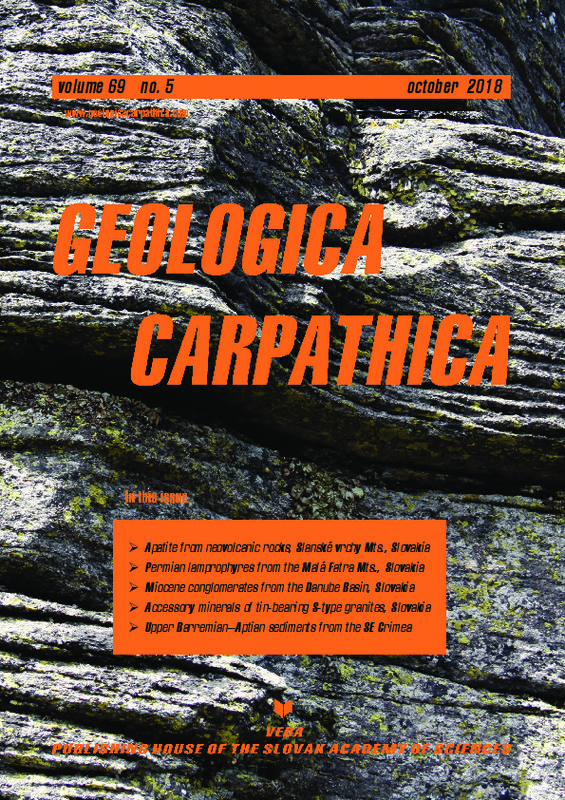 Abstract: The apatite assemblage from Maglovec hill (Slanské vrchy Mountains near the city of Prešov) from fissures of hydrothermally altered neovolcanic rocks (andesites and related lithologies) was studied. The assemblage consists of two different morphological apatite types (apatite in cores of prismatic crystals and fibrous apatite mantling these cores). The assemblage was investigated by a multi-analytical approach to reveal its unique chemical composition and structure. Both types of apatite display zoning visible in back-scattered electron (BSE) images. Core apatite is relatively homogenous with porous rims appearing darker in the BSE images at the contact with fibrous apatite, and occasionally with darker regions along fractures. These parts are depleted in trace elements, mostly in LREE. Fibrous apatites display concentric and/or patchy zoning. Dark regions in fibrous apatite occasionally display a porous structure. In part of fibrous crystals, substitution of (CO3)2− for phosphorus is confirmed by Raman spectroscopy by the presence of a band at ~ 1071 cm−1. This method also confirmed the presence of OH in different populations in the structure of all apatite types. The three most important observed peaks are caused by vibrations of hydroxyls influenced by different adjacent anions: hydroxyl (band at ~ 3575 cm−1); fluorine (band at ~ 3535–3540 cm−1); chlorine (band at ~ 3494 cm−1). In REE‑depleted parts of both apatite types, fine inclusions of monazite and rarely Th-rich silicate are observed. The acquired data suggest a hydrothermal origin of this assemblage and indicate a formation sequence of distinct apatite types. Moreover, minerals from the epidote group were identified, which have not been described from this locality before as well as vanadium-rich magnetites that form exsolution lamellae in ilmenite grains.